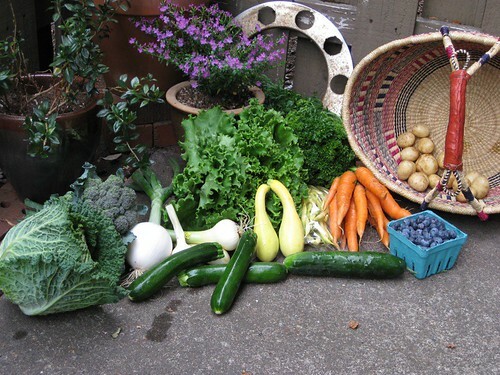 CSA Week 8 - Crochet, Starbucks and roadtrips, oh my! Yum. Again, I'm struck by how pretty veggies are, this time with the appearance of the ruffly cabbage we got. I'm excited to let the green beans squeak in my teeth - I already ate one as I was loading up the fridge. No tomato this week - they said they're between their early crop of Siletz and high summer crop of Big Beef. I wonder if the beef tomatoes taste different than the Siletz - getting them straight from the farm, I'll be able to tell (whereas the store-bought ones all taste the same: mushy and mealy). Do your friends buy from the same vendor every time? I would think they'd be able to chat with the farmer and see if they'd be willing to work with them to set one up.